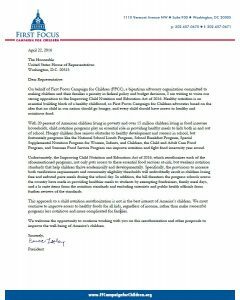 On April 22, 2016, the First Focus Campaign for Children sent a letter to members of the U.S. House Education and the Workforce Committee strongly stating its opposition of the Improving Child Nutrition and Education Act of 2016. We believe healthy nutrition is an essential building block of a healthy childhood and that no child in America should ever go hungry. Students who have access to healthy and nutritious food perform better in school. Twenty percent of American children live in poverty and more than 15 million children live in food-insecure households. Child nutrition programs play an essential role in providing healthy meals to kids both in and out of school. 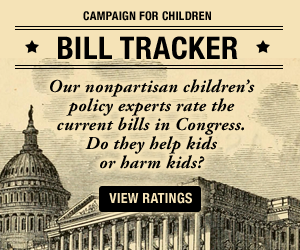 As introduced, the House Improving Child Nutrition and Education Act of 2016 (H.R. 5003) would put access to many essential children’s food programs at risk. The bill also weakens nutrition standards that help children thrive academically and developmentally. Specifically, the provisions to increase both verification requirements and community eligibility thresholds will undoubtedly result in children losing free and reduced price meals during the school day. We must continue to improve access to healthy and nutritious foods for all kids, rather than create additional barriers for the families who need it most.